Bingo Hall is an online bingo including mobile and live dealer games, established in 2001 using games powered by multiple software providers. It is operated by Digital Entertainment and is licensed under the jurisdiction of Curacao. BingoHall features a fun, cute star as their mascot. Players can then earn stars as part of BingoHall’s VIP program. Players use these stars to advance in the VIP program and purchase items in the Bingo Shop. Several jackpots are prominently displayed on this online casino’s homepage, which shows that these jackpots are a focal point of the entire online casino. Most jackpots are a few thousand dollars, but the Super Nova jackpot can get into six-digit numbers. This online casino is licensed in Curacao and is owned by the Bingo Hall Group. It not only offers Bingo games, but it also offers an array of other casino games as well, specifically slots. Bingo Hall is able to claim at least 15 years in the gaming industry, making it an extremely experienced online casino that has become very popular. In fact, the casino states that it includes roughly 2.5 million players from around the world. The main site is offered in English, and it does not appear there are any restrictions on who can play at this online casino, but players should abide by their countries online gambling laws. This online casino does not appear to accept players from the United States. 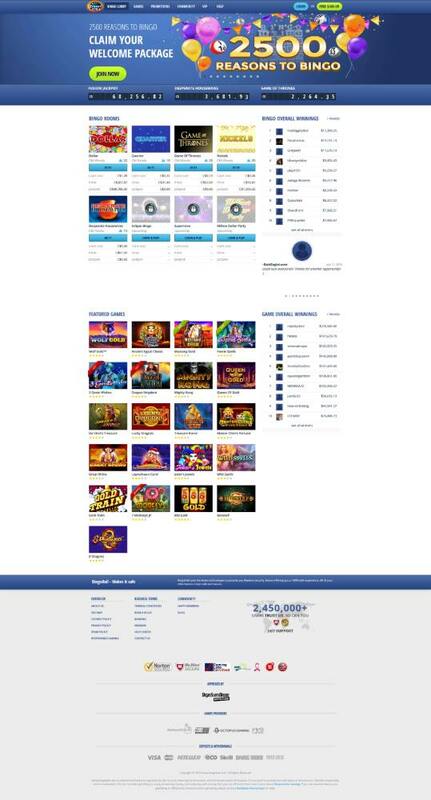 Their site is operated by Digital Entertainment Services Ltd.
BingoHall boasts a 2015% bonus on the first three player deposits, which is similar to the other Bingo sites that have the same look and set up, like Bingo For Money and Bingo Canada. Like these other Bingo sites, Bingo Hall also offers a wide range of bonuses and promotions—from vacations and electronics to match bonuses on deposits. One of the most interesting features of these online Bingo casinos, however, is the ability to win more at specific times of the day in featured rooms. For example, the Million Dollar Party is available on Saturday evenings, and players have the potential to win large cash prizes. The first jackpot is set at $2 million, which is extremely high for any online casino. They also have a Jet Set room, which is their room tailored to their VIP players and offered at specific days and times. Players also get a no deposit bonus of $25 or an exclusive $30 no deposit bonus to try out the casino games and Bingo rooms. Players just have to create an account to receive this deposit. Then, Bingo Hall offers a first deposit bonus of 550%. There are random daily deposit bonuses as well. These match bonuses increase as the amount deposited increases as well. For example, on Mondays, the player will receive a 250% match bonus for any bonus above $50. If they deposit more than $100, then the match bonus increases to 400%. BingoHall uses software from Betsoft, Parlay Entertainment, Rival, PragmaticPlay. Parlay Entertainment is an award-winning provider of Bingo games and Betsoft produces outstanding online casino games like a variety of slots and other similar options. Both software providers are well known in the gaming industry for providing great games with interesting characters, high-quality sounds, and amazing graphics. When these two software leaders are paired together, the experience is extremely enjoyable and high quality. This online casino does not require a download and is only available via instant play using Flash. This instant playability does allow players to move seamlessly from one game room to the next without having to worry about slow load times or downloading anything. This also opens this online casino up to users who may use a Mac operating system. Online casino downloads are not as friendly to Mac users, so the Flash instant play option is helpful to these users. Bingo Hall does state that security is very important to them and that they use encryption to protect their players’ information, including payment and withdrawal methods as well as overall communications. However, the site does not list how their games are tested for fairness and randomness. Nonetheless, Parlay Gaming and Topgame are both big names in the online casino industry, so they may do their own independent testing so Bingo Hall does not have to. The main feature of this online casino is obviously the Bingo gaming options. They offer at least 6 Bingo rooms, including a Dollar, Quarter, and Nickel room. Other rooms include Crazy, which is a $0.10 room, Desperate Housewives, a $0.20 room, Fusion Room, a $2.00 room, and Fair and Square, a $2.50 room. Each room has its own theme and varying jackpot and prize amounts. They also offer several other types of games including video poker, pull tabs, video slots, and Keno. At this time, Bingo Hall does not offer any additional traditional online casino games like card games or table games. Bingo Hall emphasizes the importance of enjoying online casino games with other players, so many of their gaming features center around chat options and tournaments. Bingo Hall believes that online gambling experience is enhanced by interacting with other players. They even offer specific rooms that focus on this aspect. For example, the Taboo room takes out (or tones down) room moderation so that players can chat without filters for a more enjoyable Bingo experience. This feature is unique to Bingo online casinos (and those with multiplayer table games) because many other gaming options, like slots, are not conducive to sharing the online casino experience. Bingo Hall’s customer support is available to answer questions and address gaming problems 24 hours a day, 7 days a week. Players can get in touch with customer service through e-mail, phone, or by using the live chat option. The live chat option is probably the fastest way to contact customer service, but some players prefer other contact methods as well. There are separate phone numbers available for VIP users and many countries have their own customer service numbers as well. The United States, Canada, Europe, Italy, Australia, and South Africa all have their own designated support phone numbers. There are also several helpful pages on the website that user can use to answer their questions, including a Frequently Asked Questions page, a terms and conditions page, and a payments page.